BANGKOK, 14 March 2014 The Election Commission has begun to deliberate on the issue of Pheu Thai Party candidates going on television at the state-run NBT Channel during the election period, as such action may give rise to advantages and disadvantages in the poll. According to Election Commissioner Somchai Sisutthiyakon, the Public Relations Department director-general and the director of NBT Channel may have violated the EC’s regulation and election law. 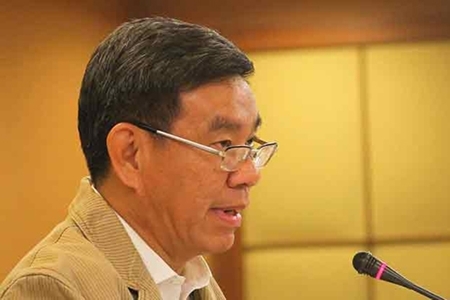 Three ministers; Suraphong Towichakchaikun, Chaturon Chaisaeng and Nutthawut Saikuar may have violated Article 181 of the charter as well as EC regulations. The EC will convene a meeting on March 27 to further consider the issue. Police Captain Chaloem Yubamrung, who was an MP candidate under the Pheu Thai party in the latest election, asserted that most of the Pheu Thai candidates who went on television only spoke of the political situation and the holding of the election, not their vote-rallying policies.